While Ron Gilbert once acted in their supervisor, Schafer and Grossman now found themselves taking on his singular role. But this shared position didn't lead to a battle of egos—in fact, the credits of Day of the Tentacle are programmed to randomly list either Schafer or Grossman's name first—leaving the matter of "top billing" to a random number generator. This kind of egalitarian company culture led to a very collaborative production process, where artists, animations, writers, designers, and programmers were free to contribute their own ideas. Tim Schafer: I always really valued working with Dave, because we worked together and shared an office for years, and we never had a conflict about anything. I think we were both people who don't want to be in conflicts, very conflict-avoidy type people, and Dave was just super mellow and very logical, talks things out. I don't think we ever had a disagreement. If we would, it was always just a friendly discussion. And we also had our areas of the game, maybe characters or dialogues we kind of owned. Just like Monkey Island. I would do Stan the ship salesman, and Dave would do Herman Toothrot, and we didn't tell each other how to do each others' characters. Dave Grossman: The nature of collaboration didn't change at all. That wasn't a company change, just Tim and I got promoted, and we were now doing Ron's job. I at least took a lot of cues from Ron about how to do that job, because a lot of the way that the collaboration worked on his projects was a way I wanted collaboration to work. Super open, and there was a group of us whose job it was to sort of come up with the story and design the puzzles more or less at the same time, and we would do a lot of brainstorming on that. But other people were always welcome to come and be part of that process, or weigh in whatever they felt like they needed to weigh in on. TS: I often have referred to it as the last easy project to make, because there was no voice until the end and there was no 3D. So, everything was "what you see is what you get." We'd write text, it would be on the screen, they'd draw the art and put it on the screen. Everything was so smooth. And they had a very senior team, it was a very flat team, because we were always working for Ron. So, it's kind of like Ron left, and we were all on the same level. So, even though we were in charge and the artists worked for us, we were used to working side-by-side on Monkey 2. DG: In terms of Tim and I together, we had a good dynamic. It's almost like we were in a good marriage or something. I look for the same things in romantic partners as creative partners, and that's basically, "Does the synergy work well?" Like, when you're playing off each other, [the] ideas getting generated. And then, more importantly, how well you resolve differences. And for us, if we had two different opinions about something, we would talk about it for a couple minutes. And it would usually become apparent really quickly either who was right or who cared about it more. And, if it was the second thing, we generally would go with that. Someone would have more passion or feeling about it, so we'd just do it that way. TS: Going back to the formation of the country was just something that led to a lot of great puzzles. We could change the Constitution to include things that would help you solve puzzles, and it just naturally seemed really funny to us. But we did think about the international market, specifically, marketing and management were like, "You guys, no one knows who Ben Franklin outside this country. This is not going to sell, but, let's try it." And they told us it sold better in France than in America. Or, definitely Germany. Sold more in Germany than in America. And, the fact is, just in Europe they're better educated about American history than we are about European history, for sure. DG: You'll notice it's not real American history, but sort of legendary American history. Everybody is sort of fifth-grade interpretations of the things [we've] heard, so you get the George Washington's cherry tree and the wooden teeth. So, when we were talking about American history, those things were all coming up, and I think the specific moment that we chose within that came out of a desire to literally change the country in a frivolous way by editing the Constitution. That was an idea that occurred to us. “Oh, yeah, if they're making the Constitution, then we can put stuff in it, and it will be silly and arbitrary and that'll be great.” So, that was why [we decided on] exact dates for [the past], just so we could muck around with the Constitution. It seemed like a good thing to do. TS: It's kind of a spoof of taking the bigger, more comical stereotypes about George Washington and the cherry tree. Then again, if you don't know the story about George and the cherry tree, that might be a weird puzzle to [solve]. But then, they're solved the way all adventure game puzzles are solved, which is just, you talk to all the characters and try all the objects, and eventually something gives you a hint. DG: We definitely thought about [DoTT's reception outside America]. But, we figured we were doing things that were sort of so basic that they would be universal, and we weren't right about that. But that was what we thought, and, we just went for it. I guess by that time, we knew already that basically a third of our audience was in Germany, so we probably should have thought more about that. It doesn't, in retrospect, seem to have hurt things very much. And that's good. The game is still a success, and people are still talking about it. So, I feel like we must have done something good, but we probably, if I had it to do over again, might think a little bit more globally about it. TS: You see in modern reviews of adventure games when they talk about how hard the puzzles are, I feel like those people did not poke on them enough. In the old days, you were expected to talk to everybody. Talk to them all, exhaust the dialogue trees, talk to everybody, try all the objects. If you're trying to open a door, and one of them will be like, “No, I can't use that, because it's rusted shut. If only I could break the rust,” or something. Get some hint, "Oh, I think I know what to do now." 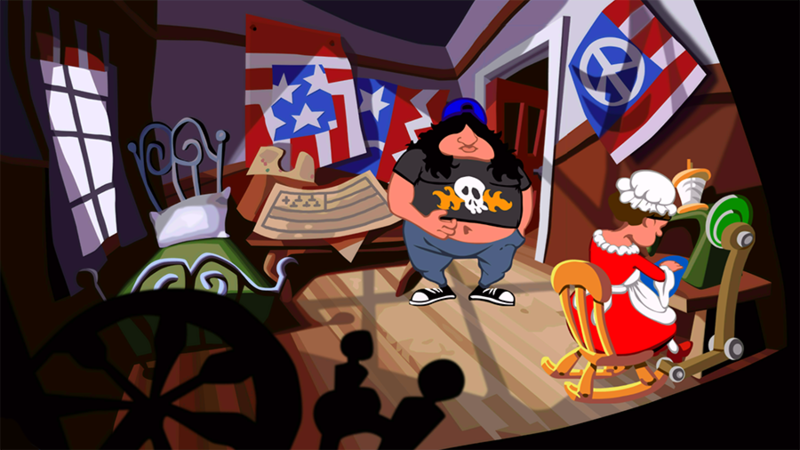 Tagged with 1993,	Dave Grossman,	Day of the Tentacle,	Double Fine Productions,	Feature,	LucasArts,	Maniac Mansion,	PlayStation 4,	Tim Schafer,	USgamer.